I have been taking these Year to Year portraits on New Year’s Day since 2005. 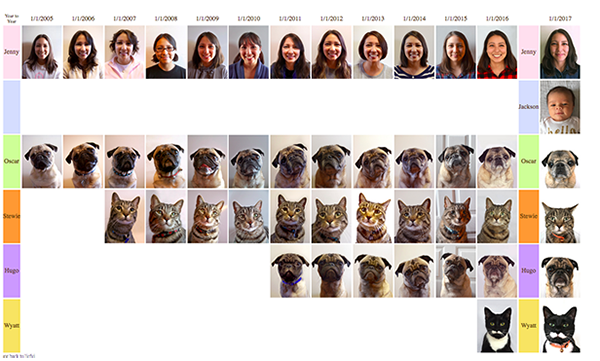 This year… my Year to Year photos look a little different. In July of 2016, when I was five months pregnant, my husband of 12 years (and boyfriend for 10 before that), made the decision to leave this family. It has been incredibly hard these past months. You will see many of my posts lately were either me trying to maintain some sort of norm or simply a bit of scripture. I am heartbroken, not just for the end of our marriage but for my son. This was not the family and life that I had imagined for him. I have got through it with the help of my friends, family and church family. They raked my leaves, accompanied me to childbirth classes, sent plows in snowstorms and always lent sympathetic ears. I am forever in their debt. This month Jackson and I will be moving back to Pennsylvania to be with family. I will miss Rochester and all of my friends but 2017 will be a year of fresh beginnings. Scripture says God uses trials to bring you closer to him. Indeed my faith has been strengthened and carries me through each day. And just this morning in church these two verses jumped out at me. Jackson is here now and is all I could hope for. I am very blessed and we have lots to look forward to in 2017. Happy New Year everyone! Yay! I'm so happy you are blogging again! Jackson Fox is such a beautiful baby! I love seeing all his photos and hope you will write about the Mother experience on your blog too! Thank you for being my favorite blogger of all time!! Welcome back, Jenny! Looking forward to reading about your adventures again! Congrats on Jackson! I am hope 2017 is a wonderful year for you and your son (I noticed Aaron is not in the New Year photos... hope there is nothing wrong, and if there is, you are in a good place and happy). best wishes! Looking forward to following your new adventures. Much love from Las Vegas! happy new year, ljc! so glad to see you back here. it's true what they say, motherhood will be the hardest job you've ever done... but it's crazy amazing how it brings everything into focus somehow, like donning a new pair of glasses one day and suddenly thinking, "ohhhhh, so THIS is what they meant." congrats! Wow - big changes. Sending you best wishes for what looks like a very different life. Welcome back! I've missed your posts! Jackson is perfect and you look wonderful every single year. Here's to peace and joy in 2017. I always enjoy seeing your yearly pics! I bet the tradition will be even more fun for you in the upcoming years! :) Looking forward to reading blogs from you again too! Congratulations on your little one! Welcome back to blogging! I have missed your posts. But I love seeing your pictures on Instagram. Hoping you and Jackson have a great 2017! Longtime reader and Instagram follower. So glad you might return to blogging now and then- I've missed you! Team Jenny all the way. Wishing you and Jackson all the best in 2017! Looking forward to more posts! And to share the sentiment of another commenter: Team Jenny, indeed! Happy New Year! Glad to see you're back! At least we had Instagram to tide us over for the last few months. Glad you are blogging again! Congrats on Mr. Jackson! Long time reader, very rare commenter here to say welcome to the world, Jackson Fox! Also, even though we've never met, I know you enough to see there have been big changes. I wish you all the best in 2017 (and beyond). Congrats on Jackson Jenny!!! I have been reading for soooo long...,glad you are back! Enjoy the many new beginnings with Jackson Fox! Best wishes on your new adventures together.